We recently had the experience of chatting to Mike Buckland from Triggerfish Animation Studios. It was quite the experience to be able to have a quick few minutes to ask him if he would be willing to do this interview with us. Triggerfish Animation Studios creates awesome work. That’s a fact. In 2012 they launched Adventures in Zambezia and put S.A on the international map, but they didn’t stop there. They went on to produce Khumba and now recently, the hugely popular Stick Man. Stick Man was not only released worldwide on Christmas day, but the movie was also screened at the recent Cape Town International Animation Festival. On top of that, we had the privilege to sit in and hear Mike and his team talk about their experiences during production. So without further ado, scroll down to read more about this masterpiece! What was the experience like for you at the CTIAF, presenting your work and seeing what S.A is doing ? Do you think that animation in S.A has played a large role in the development of our country? Please tell us how you feel about the fact that you are one of the leading animation studios in South Africa? Please give us a short intro on Stick Man and the role Triggerfish Animation Studios played in the production of this amazing film? We were amazed at the work your team did on Stick Man. Please tell us about the animation style that was chosen for Stick Man? One of the key things that stood out for me, is that you got the 3D characters to look so much like clay. How did you get the textures of the characters to look so real? What was your personal favourite moment while working on this production? What would you say is one good thing that international studios have been saying about us? What was the overall experience like for you as a team member on this project? What beverage was consumed the most by team members during the production? If we missed Stick Man on BBC one, where can we purchase a copy of the DVD? Where can we read about news and updates on Stick Man? We recently saw a Social Media post that Triggerfish Animation Studios is hiring? Where can we follow Triggerfish Animation Studios on Social Media to stay updated on latest news and events? It was an honour for us to present our work at CTIAF. I think its always slightly daunting to show your work to your peers in the industry, but the amount of enthusiasm we got for the work was very encouraging. One of the best things about the CTIAF is meeting up with local animators and seeing their work, both at the student and graduate level right through to the seasoned pros in the industry. There is some very exciting animation being done in South Africa and we’re really proud to be a part of that. I think that it has had an impact in different areas. The more international work we as a country are able to deliver successfully – on budget, on time and on standard – the better our reputation as a producer of animation becomes. I think that benefits the industry as a whole, although perhaps compared to mining and other large scale operations we’re not making a massive impact on the economy of the country yet! But we will see more and more work coming to SA, and one of Triggerfish’s goals is to change the way people see Africa through creating high quality, positive stories that go out to an international audience. Hopefully our work will help to be a good ambassador for Africa and its capacity for producing high quality animated content. The animation community here is definitely growing in both number and experience, but we are still comparatively small when you look at other countries. I think we’ll see it grow if more work comes in that provides opportunities for more animators to find employment, and gives them fresh challenges to develop as artists and creatives. I’m excited about the future of animation from what I’ve seen over the last 10 years, so I expect it to grow and get better every year. I feel extremely proud of the amazingly talented people that have contributed to our projects over the years, and also of my partners at Triggerfish who have put so much hard work into establishing our studio as a force within the industry. This is our 20th anniversary year and it has been a long and difficult path to getting to where we are now. I hope we’ll manage to keep growing and challenging ourselves for another 20 years! 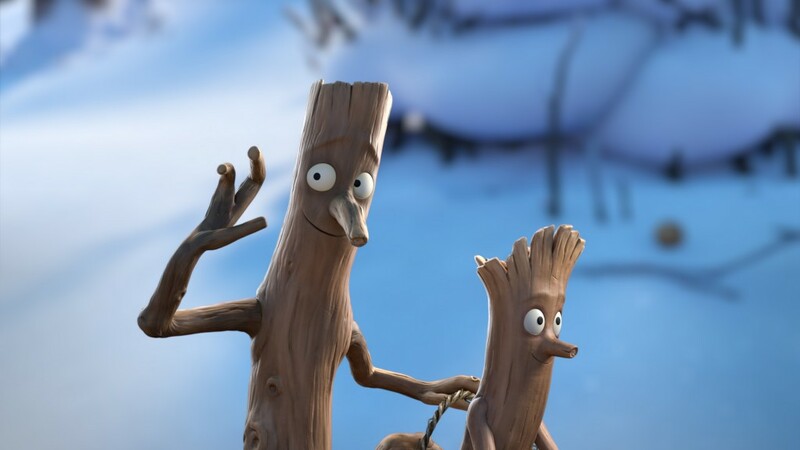 Stick Man is a charming short film about a kind and loving father who is taken further and further away from his home and family through a series of unfortunate incidents. His cheery and positive nature is tested severely by the events of the story, but in the end, his willingness to help others despite his own circumstances is what enables him to find his way back to his family. Magic Light Pictures in the UK was commissioned by BBC1 to produce Stick Man, and they brought the project to Triggerfish. Magic Light provided the Director, Jeroen Jaspaert while Triggerfish put forward South African Daniel Snaddon as our Co-Director. As Triggerfish’s producer I was responsible for delivering the project which involved a large team of up to 60 South African animators and artists working on various aspects of the animation process from storyboarding through animation to lighting, comp and final render. Magic Light managed the script development, voice recording, postproduction, music and sound mix. It was quite a tricky style to find, as we needed to emulate the look of stop frame animation but found that in some cases we got a lot of strobing on fast movements. We ended up with hybrid approach where we animated on 2’s for subtle movement, but would key every frame for big movements and action. We also had to make sure that we could achieve the range of expressions and motion that would create a convincing and endearing performance but without losing his essential stick-ness. Martin Freeman’s delivery of Stick Man’s voice was a great fantastic way for the animators to get into his character and they made great use of the reference videos we shot of Martin as he recorded his lines in the studio. We spent a lot of time analysing the previous films, to see what we could take from their design sensibilities, and we researched a lot of stop frame sets, toy train models, any kind of miniature set and those gave us a lot of guidance on what each different object was constructed from. We ended up with a variety of materials such as paper, clay, plastics and dirt. Then we did a lot of sculpting in Zbrush on almost every prop and character to create displacement maps that enhanced the slightly wonky hand-made feel of each item. We had two very talented shading artists who then worked in conjunction with the texturers and lighters to create realistically shaded surfaces that emulated the various materials that would be used by a real life model maker. It’s hard to pick one out, because there were many good and bad moments in the production, but one that stands out for me is when I first saw the rough previs sequence of when Stick man finally realizes he’s going to get home. I watched that and got such an emotional hit, I knew then we’d managed to create a character that we could really root for. And if it worked at that stage, then it would really have an impact once the sequence reached final picture with all the sound effects and music. I think they look at the work that’s coming out of South Africa and can see that we’ve reached a certain maturity in the industry – we can hit the quality expectations, we communicate well, we’re reliable and resourceful. And while we’re not competitive with the East in terms of price, we’re more cost effective than studios based in Europe or the US, so we’re attractive to studios that are looking for a good mix of quality, reliability and value for money. It was extremely tough, in fact! We had not worked with the external director (Jeroen Jaspaert) before, so it took a while to adjust to his way of working and communication. We all felt the pressure of the need to exceed the bar set by Magic Light’s previous, Oscar nominated shorts (The Gruffalo, The Gruffalo’s Child and Room on the Broom). We found that just about every person on the project levelled up in a really significant way over the course of the production because the standard expected was so exacting. I think most of us had dependency issues around various caffeine products! It’s actually hard to get a copy of Stick Man in Souht Africa, as they do not yet have a distributor for this territory. However you can get it on itunes or order a DVD from Amazon. You can follow the Stick Man facebook page, or just keep an eye on Triggerfish’s own facebook page. We’ll be making a lot of noise about it, especially if it’s up for any awards in the festival circuit.